Even if Google didn't mention it in the release notes, Chrome 7 has support for installing web apps, but Chrome Web Store is not yet released. The store will be the most important new feature in Chrome 8, which will be launched very soon. "Chrome 8 is the first version that supports the Chrome Web Store," mentions a Google Chrome engineer. There's already a new icon for the store in Chromium and this should be the final icon. Google Chrome 7 was launched on October 21, almost 6 weeks ago, so Chrome 8 and Chrome Web Store should be available this week. 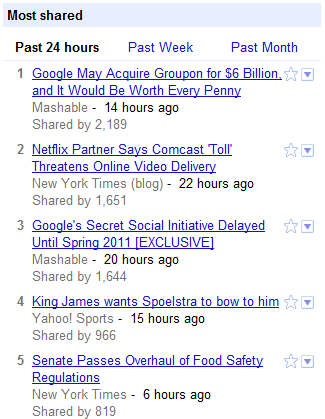 Google News has a new section that lists the most shared articles. It's not clear if Google counts the number of people who used the sharing feature from Google News or tracks the references from Twitter and other social sites, but Google's chart is not very reliable. 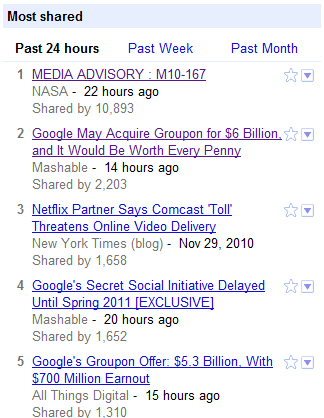 When I started to write this post, the most popular news article was a story about Google's Groupon acquisition that has been shared by 2,189 people. 15 minutes later, the most popular article was a NASA press release shared by 10,893 people. If you happen to find a YouTube comment that's really interesting and you want to share it with other people, mouse over the comment, click on the "Share" button and copy the link. Each YouTube comment has a permalink, but it's not easy to notice that the comment is displayed below the video in a special section titled "Linked Comment". You could also use this feature to annotate a video before sharing it with your friends. Post a comment, copy the link and use it to highlight your comment. Google Earth 6 doesn't have too many new features. You can now use Street View just like in Google Maps by dragging the pegman icon. "To view street-level imagery for a specific location, zoom into an area at an altitude of approximately 500km. You will see a pegman icon appear at the top right below the navigation controls. Click and drag the icon across the 3D viewer. A blue border will appear around roads that have street-level imagery available," explains Google. Another new feature is the "3D Trees" layer that can be enabled from the "3D Buildings" section. Google Earth includes 3D models for city parks (San Francisco, Chicago, Tokio, Athens) and remote forests (Amazon Forest). Historical imagery is now more accessible: just click on the date of the oldest imagery in the status bar and you'll be able to see all the historical images that are available for the same location. Google Earth 6 also adds ground-level navigation that lets you explore 3D buildings and 3D trees, 3D measurements for heights and widths of buildings and a much better Tour Recorder that improves motion fidelity. 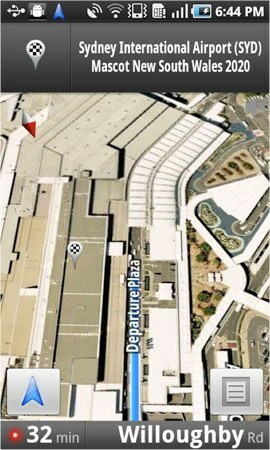 Three years ago, Google introduced mapplets, a special flavor of gadgets that added new features to Google Maps. "Mapplets are Google Gadgets that are made especially so that they can be loaded by a user on maps.google.com, and have access to the main shared map. Users can load multiple Mapplets simultaneously for a quick and easy way to mashup content from multiple sources." In May, Google announced the deprecation of mapplets, but only developers cared about that. 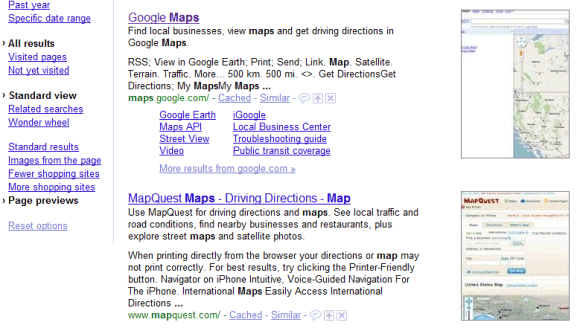 Users could still go to the "My Maps" section from Google Maps and add a mapplet from the directory. Unfortunately, Google Geo Developers Blog informs us that the directory will be closed and all the links to mapplets will be removed. As part of the deprecation plan for Mapplets we will shortly be switching from rendering Mapplets within Google Maps, to rendering them on a dedicated Mapplets page. (...) Bookmarks for existing Mapplets will continue to work. 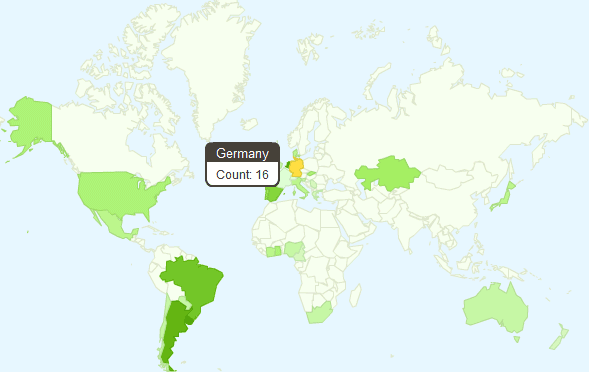 They will be automatically redirected to the new Mapplets page for the relevant Mapplet. (...) However because the Mapplets page is not part of the Google Maps application, Mapplets will no longer have access to Google Maps user profiles. (...) The above changes will be made on or shortly after Wednesday December 8th 2010. Google Chrome has always supported multiple profiles, but you had to use a command-line flag (--user-data-dir="c:\path\to\the\profile") to associate a profile with a folder where the browser will save its state. At some point, Google added an option that allowed you to open a new window and use a separate profile, but it was quickly removed. 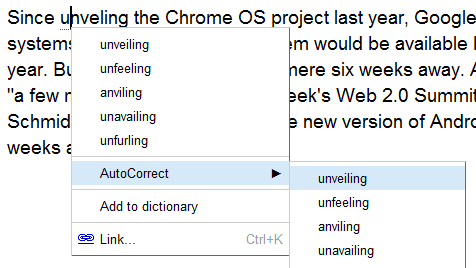 According to a design document from Chromium's site, this feature be available again. "The multiple profiles feature will allow the user to associate a profile with a specific set of browser windows, rather than with an entire running instance of Chrome. Allowing different windows to run as different Chrome identities means that a user can have different open windows associated with different Google accounts, and correspondingly different sets of preferences, apps, bookmarks, and so on -- all those elements which are bound to a specific user's identity." Users will be able to associate a profile with a Google account and log in at the browser level. This is a great feature for Chrome OS, but it will also work in Google Chrome. Google will associate each Chrome window with an identity. "On Windows (and Linux), this is accomplished with a colored and labeled menu-enabled tag at the top of the browser frame, next to the window controls. On Mac OS X, the window frame is too small to accommodate a tag; instead, we add an item to the menu bar, with a special colored background, in the same way the Windows tab is specially colored." I've never been a fan of Gmail's Web Clips, but I didn't disable this feature because it helped me keep up with news from popular sites without subscribing to them in Google Reader. The most annoying thing about Web Clips is that it mixes news headlines with contextual ads, but that still didn't make me disable this feature. Gmail has recently started to only show ads in the Web Clips box if you don't click on the navigation arrows. If you only read your messages and don't interact with the Web Clips box, Gmail no longer shows headlines. Some of the ads are useful, but showing ads was just a way to monetize the box, not the main purpose of this feature. Gmail's help center article explains that "Web Clips show you news headlines, blog posts, RSS and Atom feeds, and relevant sponsored links, right at the top of your inbox. Each clip displays the source from which it was received, how long ago the clip was published, and a link to access the entire story or page containing the clip. From your inbox, you can scroll through clips you've already seen by clicking the left arrow or see new clips by clicking the right arrow." You can disable Web Clips from the settings page, but it's too bad that the feature is a lot less useful. Google Docs added support for drag and drop uploads, a feature that's already available in Gmail. The main advantage is that the new feature doesn't use Flash or another plug-in, so it should be more reliable. "If you're using Chrome, Safari, or Firefox, you'll be able to quickly drag files into the drop area and shoot them up to the cloud," informs the Google Docs blog. In the near future, this option could be used to upload folders, not just multiple files. Google Chrome already supports directory upload using the input tag. Google Docs also added a menu option that lets you hide the title bar: View > Compact Controls. It's only available in the new document editor and it's probably more useful than the "hide controls" feature from the previous version of the editor. 1. Google's keyboard shortcuts are useful if you want to select a search result, but Google doesn't remember the page you selected when you go back to the search results page. 2. To add insult to injury, Google doesn't scroll to the search result you've clicked on after visiting the page and returning to the Google SERP. 3. Let's say that a search result snippet includes a useful information and you want to copy it. If you double click on a word from the snippet, you'll trigger Google's instant previews. 4. If your query includes quotes, Google's suggestions aren't useful because they ignore your quotes. 5. Google shows too many results from a single domain. If your query includes keywords associated with a site, Google may show up to 7 results from a domain. 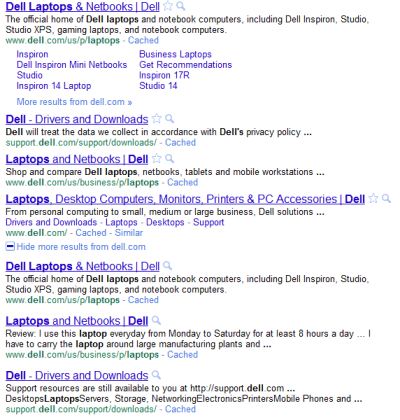 Google also lets you see other results from the same domain, but there are many duplicates. 6. If you restrict the results to visited pages and perform the same search using Google Web History, you'll get different results. 7. Sometimes personalization goes too far and replaces the top search result for a navigational query. Did you find other annoyances? 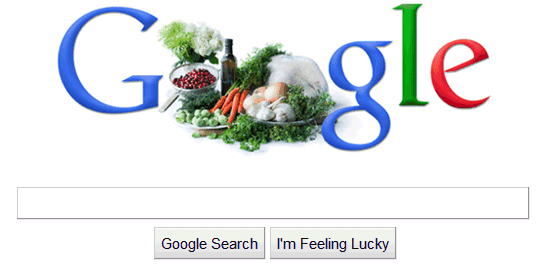 Google's doodles were special because they linked to search results pages, instead of linking to handpicked pages. Some doodles promoted Google services, so they sent users to special landing pages, but all the other doodles linked to regular results pages. 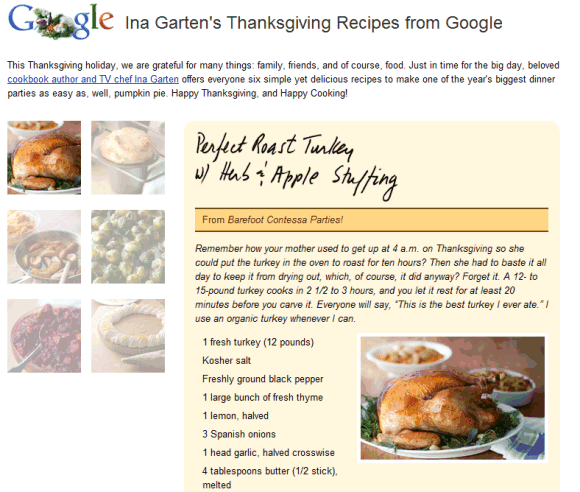 That's not the case for Google's Thanksgiving doodle, which promotes a Google page with Thanksgiving recipes from Ina Garten. "This Thanksgiving holiday, we are grateful for many things: family, friends, and of course, food. Just in time for the big day, beloved cookbook author and TV chef Ina Garten offers everyone six simple yet delicious recipes to make one of the year's biggest dinner parties as easy as, well, pumpkin pie. Happy Thanksgiving, and Happy Cooking!" Barry Schwartz notes that "it is uncommon for Google to offer pre-holiday logos" and that "the logo promotes a person without that person celebrating a birthday or anniversary". Google has finally added street level imagery for some of the biggest cities from Germany: Berlin, Hamburg, Frankfurt, Munich and 16 other cities. Unfortunately, many of the images are blurred because of privacy concerns. According to Spiegel, the launch has been delayed for several years. Nevertheless, there are considerable obstructed images in the German version of Street View. 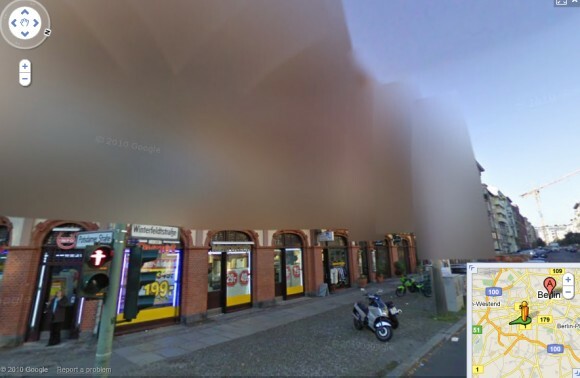 In any instance where an apartment renter asked to have their flat pixilated, Google blurred out the entire building they live in. Data protection authorities believe that up to a million households across the country have been blurred out by the company. "An IP address is a series of numbers that tells us where a particular device is on the Internet network, be it the google.com server or your computer. It's a bit like mom's phone number: just as the phone number tells an operator which house to route a call to so it reaches your mom, an IP address tells your computer which other device on the Internet to communicate with — to send data to and get data from." The guidebook is actually a great example of an HTML5 web application that works offline and Google recommends to read it in "Chrome or any up-to-date, HTML5-compliant modern browser". 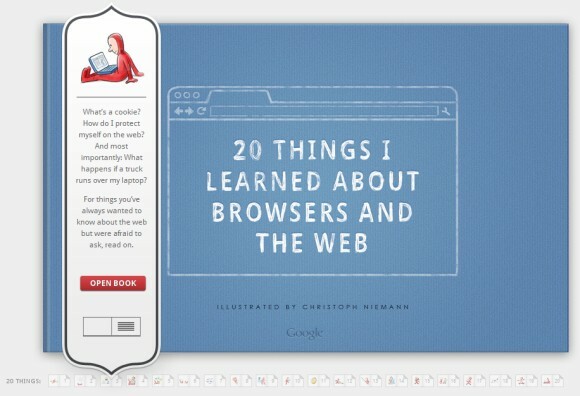 Most of the examples from the book are about Google Chrome and that's what makes it look like a Chrome ad. 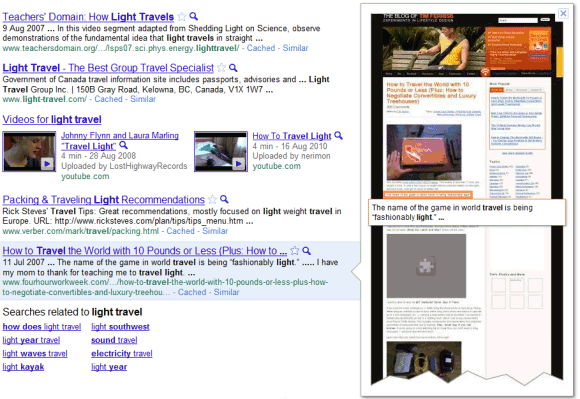 2010 is the year when Google made the most significant changes to the Google search interface. After many years of improving the underlying search technology without too many obvious changes, Google felt that it has to morph Google search into a modern web application. Today, Google's search engine has a lot of features that clutter the interface and advanced search features that can't be disabled. The focus has shifted from simplicity to interactivity. Google tries to anticipate your query after typing a few characters, you can filter the results by clicking on an option from the sidebar and you can even preview the results using annotated screenshots. Until a few years ago, Google tried to find the best search results for your query. Now it helps you find the best query for your search. Google shows search suggestions, automatically corrects typos, ignores words from your query and fetches the list of search results as you type a query. Google search is now a web app that empowers users to adjust the results and to make decisions. It's not a decision search engine, it's just a search engine that lets you decide what are the best results. Google's results are already personalized using signals like location or search history, but that's no longer enough to sift through billions of search results. The search box can't always capture user intent, so Google had to find ways to extend the search box to the entire search results page. "As people get more sophisticated at search they are coming to us to solve more complex problems. To stay on top of this, we have spent a lot of time looking at how we can better understand the wide range of information that's on the web and quickly connect people to just the nuggets they need at that moment," explained a Google blog post from 2009 that announced the search options sidebar. Google is all about reducing the friction of entering a query. You no longer have to "feel lucky" when you type something in the search box because the results are displayed instantly and you can quickly adjust them. Google's results don't have to be perfect because you can customize them until they're perfect for you. Until today, the mobile version of Google was only useful if you wanted to read a document or download some of your files. From now on, documents will no longer be read-only. If you have a phone or a tablet that runs Android 2.2+ or iOS 3.0+ and the Google Docs interface language is set to English, you'll be able edit documents from your mobile device and the best thing is that you don't need to install a new application. "It's easy to get started: visit docs.google.com in a browser on a supported device, and select the document you want to edit. Then, when you're viewing it, press the Edit button to switch to the mobile editor," suggests Google. I couldn't find the Edit button, but that's because the new features aren't yet available to everyone. Google promises that the mobile editor will be rolled out in the next few days and you won't have to buy an iPad or a Samsung Galaxy Tab to use it because it will also work on an iPhone or an Android phone that runs Froyo. Unfortunately, the mobile editor will only work for documents created using the new document editor. It's difficult to understand why Google couldn't find a way to convert the documents created using the old editor to the new format. This is a really strange bug. If you use Google to search for [android], [android market] or [android phone] from an Android phone, you won't get any result. 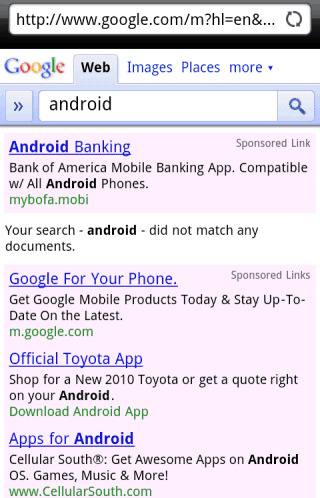 Google only shows ads related to your query and a standard message: "Your search did not match any documents". It's not clear if this is an Android bug or a Google search bug, but it's certainly not an Easter egg. If you don't have an Android phone, try this page to use the Android-optimized interface. Update: it seems that the same bug affects Google's iPhone interface and there are many other queries that don't return any result. 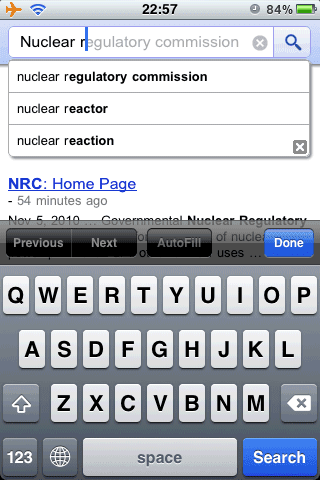 "When signed into the mobile site, I see some search results, but not for all queries. I'm on a Nexus One. In the classic interface, everything works fine," says a Google user. "I'm having the same issue on an iPhone 4. No results for super common terms, but images and location searches are unaffected," confirms another user. Update 2 (one day later): The issue was fixed. Google's free navigation software is now available in Australia and New Zealand. "Google Maps Navigation is a feature of Google Maps for Mobile that provides voice-guided turn by turn directions in real time. That means that instead of printing out your directions in advance, or having your co-pilot read aloud from list of directions, you can use your Android smartphone to guide you there directly," explains Google. To use this feature you need a smartphone that runs Android 1.6 or a more recent version of Android. At the moment, Google Maps Navigation is available in 17 countries, but this number will increase when Google starts to use its own mapping data in other countries. As Greg Sterling points out, "at some point during the course of the past couple of years, perhaps catalyzed by the shock of Nokia's roughly $8 billion acquisition of Navteq, Google decided it needed to 'own' maps top to bottom. Since that time the company has been making a systematic effort to collect and improve the base data for this highly strategic product. That's partly what Street View driving is about: getting roads and other data for Maps (and now Navigation) in addition to imagery and WiFi hotspot locations." This feature is back in Google Instant and it hasn't changed too much. You'll still see up to 3 suggestions from your Web History, but the "Remove" link is more visible and personalized suggestions have a different color. Unfortunately, Google's implementation is not great because it shows too many suggestions from your Web History and your previously typed searches are very likely to become predictions. 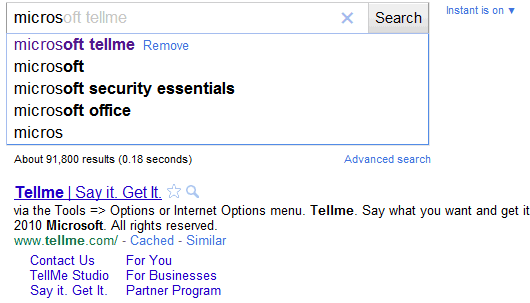 For example, if you've searched for [Microsoft Tellme] two days ago and you now start to type "micros", Google will display the results for [Microsoft Tellme]. Yahoo launched a new service that shows information about the volume of searches, popular queries and demographic information about users. 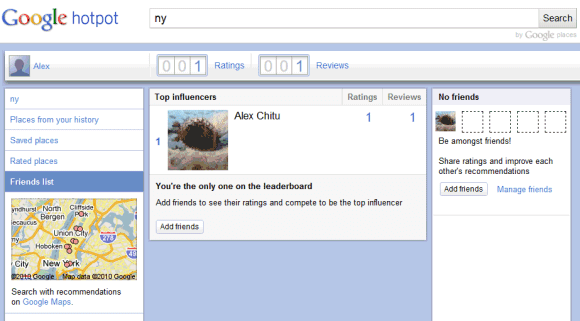 It's called Yahoo Clues and it's similar to Google Trends and Google Insights for Search. 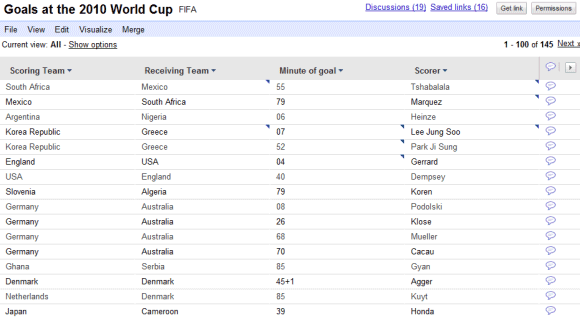 Unlike Google's services, Yahoo Clues is limited to the US and it only shows information for the past 30 days. "With Yahoo Clues, you can discover and compare trending information for search terms of interest to you, or explore popular trending search terms on Yahoo. 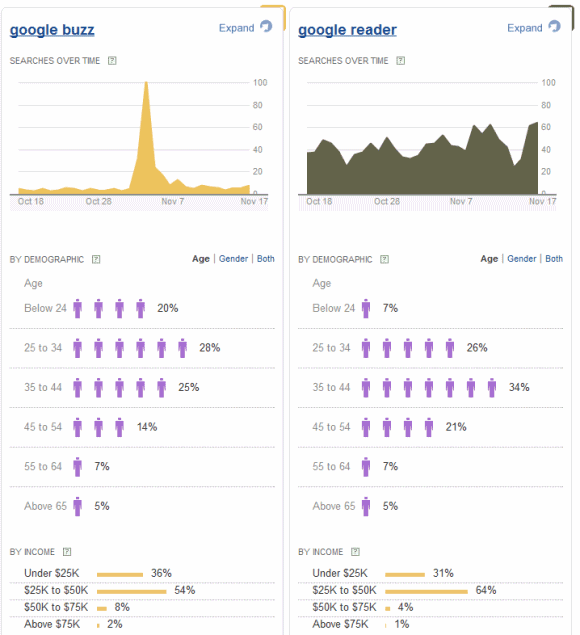 You can see search volume charts, demographic graphs, maps, or even related searches specific to a demographic group. We're also experimenting with an interesting feature called Search Flow, which offers a unique look at people's search patterns and the next most probable search term people try after searching for a query," informs Yahoo. For example, if you compare the queries [Google Buzz] and [Google Reader], you'll notice that Google Reader is much more popular than Google Buzz, it's not very popular with teens, but it's very popular with women, which is rather peculiar. If you frequently make a mistake when you type a word in Google Docs, you can now ask Google to automatically correct the mistake for you. Right-click on the word, select "AutoCorrect" and pick the most appropriate correction. 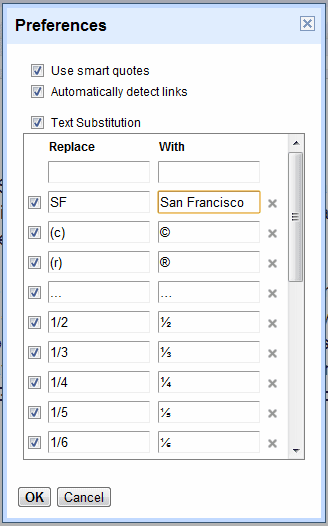 By default, Google Docs automatically converts (c) to the copyright sign ©, 1/2 to ½, but you can add other rules to the "Text substitution" section of the preferences dialog. Google Docs also added LaTeX shortcuts to the equation editor and you can now insert images inside of a cell in a spreadsheet. After almost two years of waiting, Google Voice's iPhone app has been finally approved in the App Store. It looks much better than the HTML5 web app and you can enable push notifications for voicemail and text messages. Google Voice for iPhone doesn't beat the Android app because it doesn't integrate with the standard phone app, doesn't synchronize the inbox and doesn't offer advanced options for notifications, but that's because iOS has many limitations. Google says that the application requires iOS 3.1 or a more recent version of Apple's mobile operating system. Google Voice is still limited to the US, but you no longer need an invitation to use it. 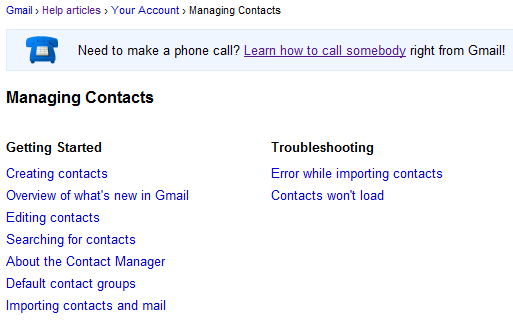 Hopefully, Google will add support for the VoIP service from Gmail in a future update. Google tests a way to monetize Goggles, the mobile application for visual search. "A year ago, Google introduced a smartphone application that lets users take photos of objects and get search results in return. The company will take that capability into the world of marketing with an experiment allowing five [US] brands to use the application in their promotional materials". Here are the five brands that are part of the experiment: Buick, Delta, Diageo, Disney and T-Mobile. Android and iPhone users in the US will be able to scan the magazine ads for Buick Regal, T-Mobile G2 and the movie posters for Disney's "Tron: Legacy" to find more information from the official sites. Michael Slinger, Google's head of mobile search advertising sales in North America, says that "it's a learning experiment for us more than an opportunity to make money," but it could be another reason to use Google Goggles. Google launched a new service called Hotpot that promises to improve local search results using recommendations from your friends. "With Hotpot, we're making local search results for places on Google more personal, relevant and trustworthy," explains Google. To get useful recommendations, you first need to share your ratings with your friends, but Hotpot's main problem is that it's not connected to any social network. When you first visit the service, Google asks you to enter a nickname for Google Places and to send invitations to some of your Gmail contacts. You're creating a new contacts group in a standalone application, instead of using an existing list of friends. 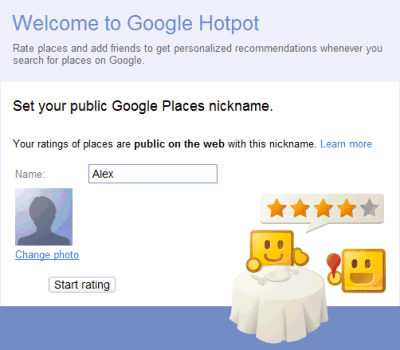 Google Hotpot is mostly useful when you try to find a place using Google's local search engine. Google personalizes the results by promoting the local businesses recommended by your friends. Unfortunately, Hotpot is a completely unnecessary service, considering that you could already review places and that the reviews were already public. Google Maps was one of the first Google services that integrated with Google Profiles, so sharing your ratings with your friends was the obvious next step. Google Reader did that in 2007, but many users were unhappy because their favorite posts were automatically shared with Google Talk contacts and some of those contacts were automatically added by Google. Two years later, Google Buzz made the same mistake by automatically subscribing users to the list of Google Talk friends. Google will never develop successful social services until users are able to create a list of friends that could be used in multiple services. To avoid the backslash from the Google Buzz launch, Google Hotpot asks you to manually add friends, but maintaining separate lists of friends is cumbersome. If you click on Gmail's "Help" link at the top of the page, you'll be sent to an appropriate section from the Gmail Help Center. Instead of always linking to the help center's homepage, Gmail links to the priority inbox section if you're using Gmail's smarter inbox, it shows the articles about filters if you're trying to create a filter and the articles about contacts if you're using Gmail's contact manager. It's a small change that makes it easy to find useful information about the Gmail feature you're currently without having to type a query. Hopefully, Google will add this feature to other services, just like the interactive bug reporting tool, which is now available in Gmail, YouTube and AdSense. You don't need to use your mouse to enable Google's visual previews for search results. Just press the right arrow key to show a small screenshot for the currently selected search result. You can navigate using the up/down arrow keys to highlight a different result and use the left arrow key to hide the previews. Google Instant Previews can't be disabled from the settings page and, despite having a similar name, it's not related to Google Instant. If you disable Google Instant, you'll still see the magnifying glasses next to the search results, but the keyboard shortcuts are no longer available. Google found a strange way to show to the world that Facebook is a walled garden that traps your data: by blocking Facebook's access to the Google Contacts API. A Google spokesperson said that "users often aren't aware that once they have imported their contacts into sites like Facebook they are effectively trapped. We hope that reciprocity will be an important step towards creating a world of true data liberation—and that this move will encourage other websites to allow users to automate the export of their contacts as well." 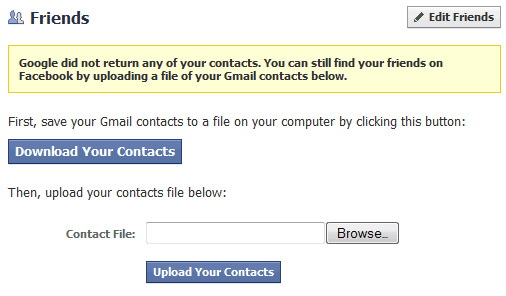 Facebook users can still export their Gmail contacts and manually upload the file to Facebook, but Google Contacts API made this much easier. 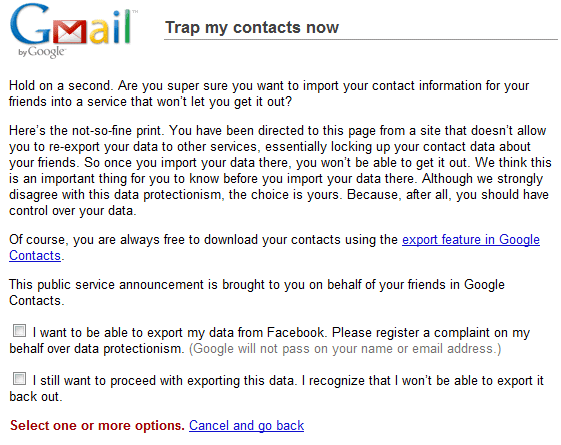 Facebook even found a direct URL that lets you export your contacts, so you don't have to visit Gmail. Google may have good intentions, but that's a terrible way to treat users. After all, it's their data and it should be their choice to use services like Facebook. That's like trying to make the web faster by asking developers that use the Google Analytics tracking code to make their sites as fast as Google Analytics. Update: Danny Sullivan quotes a Facebook engineer who says that "the most important principle for Facebook is that every person owns and controls her information. Each person owns her friends list, but not her friends' information. A person has no more right to mass export all of her friends' private email addresses than she does to mass export all of her friends' private photo albums". But that's not always the case, since Facebook allows Yahoo and Microsoft to build services that import your Facebook friends, while Google can't get that data. Danny concludes that "Facebook simply doesn't want you to mass export them into Google — not unless, I suppose, it gets a business deal with Google. And if it doesn't want to do a deal, then those emails don't get to go. They aren't yours. They belong to Facebook, and can only be exported to the business partners that Facebook agrees with." "Hold on a second. Are you super sure you want to import your contact information for your friends into a service that won’t let you get it out? Here's the not-so-fine print. You have been directed to this page from a site that doesn't allow you to re-export your data to other services, essentially locking up your contact data about your friends. So once you import your data there, you won't be able to get it out. We think this is an important thing for you to know before you import your data there. Although we strongly disagree with this data protectionism, the choice is yours. Because, after all, you should have control over your data." One of the benefits of switching to YouTube's player in Picasa Web Albums was the support for higher quality videos. 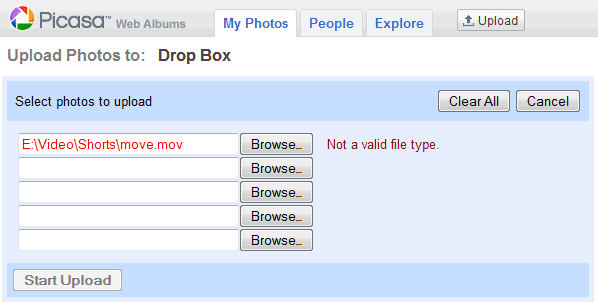 Now you can even upload HD videos to Picasa Web Albums. "We're happy to now support uploading high-definition (HD) videos, up to 720p, from Picasa to Picasa Web Albums. Whereas before you could upload, store, and share videos shot in 240 or 360p, now you can do the same for your 480p and 720p (HD) videos too." Here's an example of HD video uploaded to Picasa Web Albums. It's less than 3 minutes long and it uses almost half of the free storage quota. Unfortunately, Picasa Web's new feature would be much more useful if you could upload videos from your browser. Right now, you can only upload videos from Picasa. While YouTube lets you upload videos up to 2 GB, Picasa Web's free storage quota for all your photos and videos is 1 GB. Of course, YouTube lets you upload videos without installing an additional software. Another issue is that Picasa Web Albums doesn't offer per-file permissions, so you can't share a video without sharing the entire album. These are just some of the reasons why YouTube is a much better service for sharing videos than Picasa Web Albums. 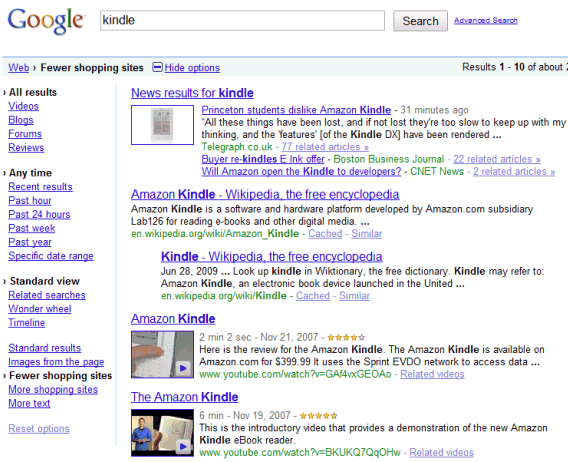 One of the most popular features available in web search add-ons is showing thumbnails next to search results. 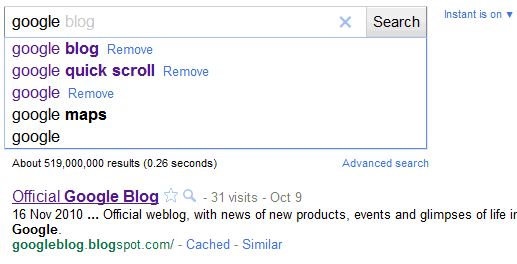 Google added this feature last year, but you need to click on "page previews" in the sidebar to enable it. Google found some clever ways to make thumbnails more useful and more discoverable. To enable the new instant previews, click on the magnifying glass or on the snippet to see a visual preview of a search result. Google shows a large screenshot of the page and highlights the text that's included in the snippet so you can quickly find it when you visit the page. After enabling previews, you no longer have to click on the magnifying glass: Google shows the screenshots when you mouse over a search result. Google says that visual previews are actually useful. "In our testing, we've found that people who use Instant Previews are about 5% more likely to be satisfied with the results they click. The previews provide new ways to evaluate search results, making you more likely to find what you're looking for on the pages you visit." I'm not sure that screenshots can help you pick the most relevant search results, but they're useful if you're looking for pages that include many pictures or videos, long articles or detailed guides. Unfortunately, you might ignore a site that has a poor design, even if the content is useful. Google Instant Previews will be rolled out in the coming days, but you can try it using this URL. To use these shortcuts, you first need to enable keyboard shortcuts in Gmail's settings page. Gmail is the only Google service that doesn't enable keyboard shortcuts by default. Andrew Banchich spotted a new Gmail feature that lets you record calls. I don't see the call record button in my account, so it's probably an experimental feature that's not yet widely available. It's similar to the call recording feature from Google Voice. "In order to record your call, simply press 4. You can do it when you first accept a call, or any time after it's started. To stop the recording, press 4 again or hang up. Your recordings are saved online and you can access them just like you do with voicemail." Instead of pressing 4, you click the record button. 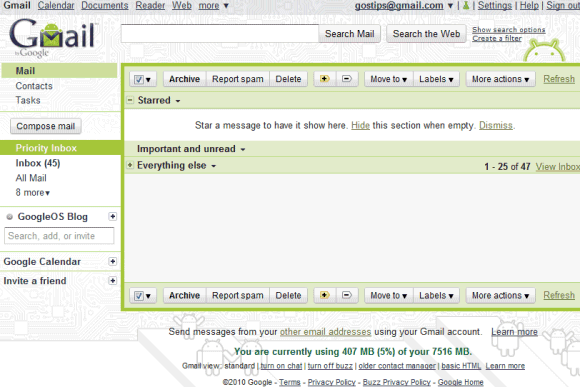 There are many Gmail themes to choose from, but few of them are actually usable. 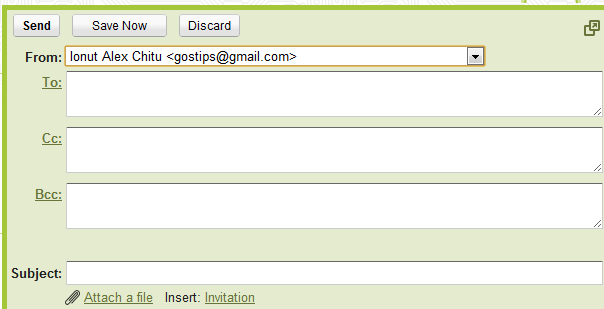 Gmail added 5 new themes: Basic Black, Basic White, Tree Tops, Marker and Android. Even if you're not an Android fan or you don't have an Android phone, you should really try the Android theme. It's simple, stylish and you can still read your messages. If you're looking for a minimalist theme, Basic White is a good alternative to Minimalist, an already existing theme. 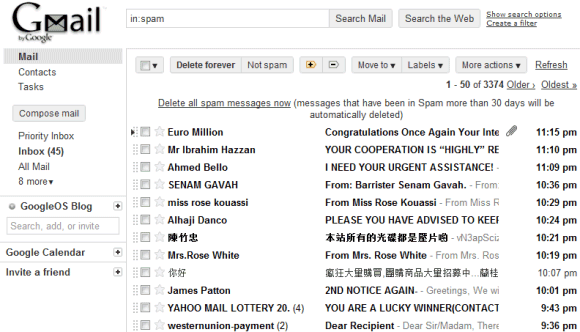 It looks a little bit unfinished, but Google says it's the Gmail interface stripped "to the bare bones". What's your favorite Gmail theme? Google Instant is now available for mobile phones, but it's not enabled by default. If you visit Google's homepage using an iPhone running iOS4 or an Android Froyo phone, you can enable the feature by clicking on "Turn on" next to "Instant (beta) is off". Google Instant should be useful on a mobile phone, especially if it doesn't have a hardware keyboard. When typing popular queries, it's amazing to see that Google predicts your searches from the first few letters. Unfortunately, the mobile version of Google Instant doesn't have all the benefits of the desktop version. 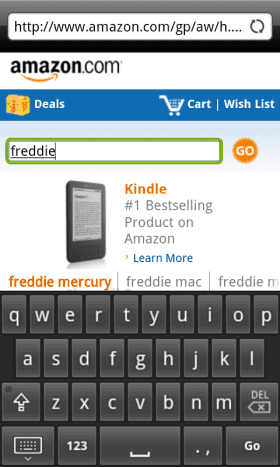 Since the virtual keyboard covers most of the screen, you can't see the search results until you hide the keyboard. Another issue is that you can't press Tab to use Google's prediction and continue to type your query. Google Instant doesn't work well if you use a mobile Internet connection because of the high latency. Google says that you should notice "a big improvement in speed when you search thanks to a new AJAX and HTML5 implementation for mobile that dynamically updates the page with new results and eliminates the need to load a new page for each query. Google Instant for mobile works best on 3G and WiFi networks, but since the quality of any wireless connection can fluctuate, we've made it easy to enable or disable Google Instant without ever leaving the page". Google Chrome is the first browser that has a meaningless version number. Since Chrome is automatically updated, most people use the latest version of the software a few days after it's released. Google's help articles aren't the only ones that ignore Chrome's version number. Yahoo has recently released a report that recommends developers to assume that Chrome users are running the latest version. "Chrome has been progressing rapidly through versions, and Google has communicated its intent to continue rapid development and short release cycles. As a result, we've modified our strategy for Chrome to advise testing on the latest [generally available] release of Chrome as soon as it is issued, with prior versions moving to X-grade as soon as they are superseded." Now that Google Chrome has a new major release every six weeks, you won't see too many new features. Chrome 7 focuses on "hundreds of bug fixes", while Chrome 8 enables the internal PDF viewer. Chrome's releases aren't exciting because the browser is constantly improving and you don't have to wait one year or more to see the new features. Google Scribe may not seem very useful, but it's one of the features that could significantly improve virtual keyboards from mobile phones. Instead of showing suggestions from a dictionary, Google Scribe can provide contextually-relevant suggestions. 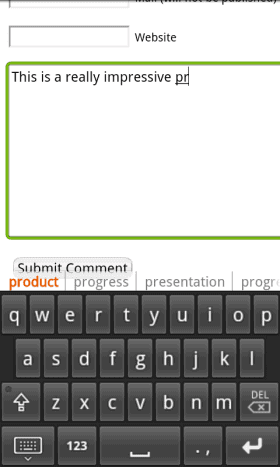 Scrybe is a free Android keyboard that uses Google Scribe to generate suggestions. It's not developed by Google and it uses an unofficial Google Scribe API, but it's an interesting application. Scrybe needs to fix many issues to become really useful. If you delete some letters from word, Scrybe is not able to detect that you're not writing a new word. Another problem is that you can't type very fast because Scrybe tries to fetch the suggestions. Reddit users think that SwiftKey has a better approach: it preloads the data, so there's no lag. "So this is basically the same thing as SwiftKey, but offloaded to Google's servers? Seems to work well, but no better (and slower) than SwiftKey," says Podspi. SwiftKey is $3.99 and there's a two-week trial. Here's a feature that will come in handy when Google Docs adds support for syncing: version history for files. Until now, Google offered this feature for the documents that could be edited in Google Docs, but not for PDFs and other files. "Previously, each time you updated a file, you would have to upload the new version as a new file with a new URL, re-share it, and put in the correct folders again. When you select the Add or manage versions option on any file, you can upload new versions of a file, download previous versions, and delete older versions." Unfortunately, this only works when you manually add a new version of a file. If you upload a file that has the same name as an existing file, Google Docs doesn't add a new version and you'll end up with two files. 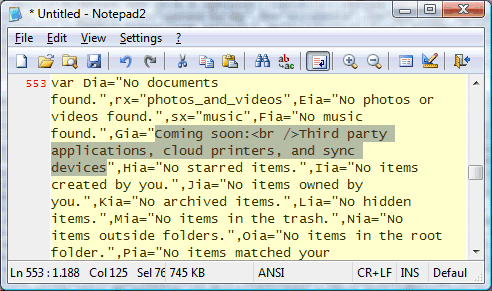 Dropbox is smarter and it automatically updates the existing file. Another issue is that you can't preview the versions of a PDF file in Google Docs, since the only option is to download the files. Fusion Tables is an interesting service launched last year in Google Labs to help users manage large data sets. "Fusion Tables is not a traditional database system focusing on complicated SQL queries and transaction processing. Instead, the focus is on fusing data management and collaboration: merging multiple data sources, discussion of the data, querying, visualization, and Web publishing," explains Google. Fusion Tables has graduated from Google Labs in September and it will become a Google Docs app. 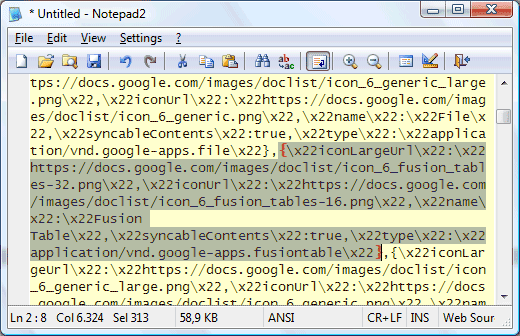 As you can see from the screenshot below, Google Docs includes fusion tables in the list of document types and there's also an icon for fusion tables. Users can already import tables from Google Spreadsheets and sharing works just like in Google Docs.